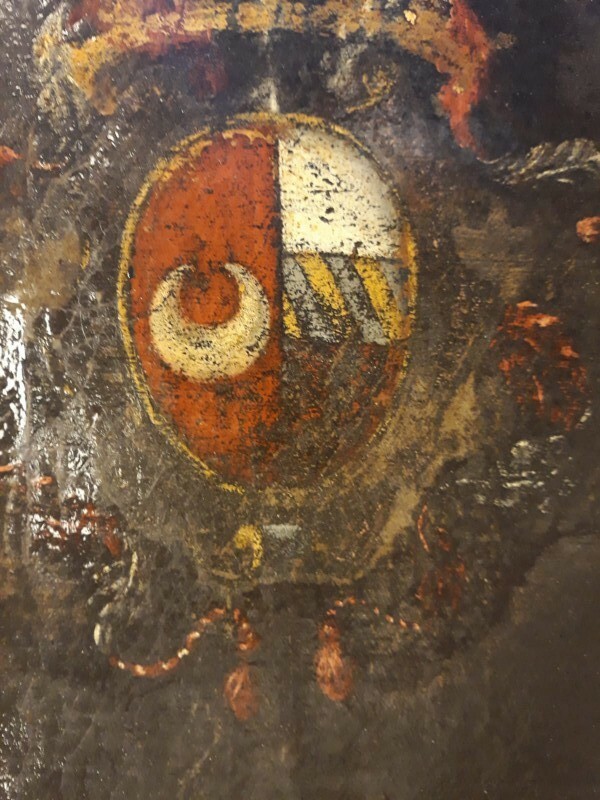 Could someone help me identify this unknown coat of arms ? The painting from which it was drawn is dated between the end of the 16th century and the start of the 17th century. The country of origin is unknown. A bit more information about the painting may help. I've come up with nothing so far. Unfortunately, I don't have any additional information about the painting, except that it is a portrait and that the subject is a woman. Although, I will not be able to give you a definitive answer, I will be able to give you some pointers in the right direction. The shield could have come from anywhere in Europe, but we can say that it is not English, Scottish, Welsh, or Irish. What we can say, is that the arms are what are called marital arms. That is to say the joint arms of the husband and wife together. These are called "Baron and Femme", or his and hers, if you like. He is on the left as we look at it and she is on the right. So, his arms are Gules a crescent Argent. Hers (would have been her father's) are far more complex and frankly unless we know the history will be almost impossible to explain. Here is where it becomes complex. It is unlikely that those were 3 separate shields that have been marshalled into one. I surmise that the shield was originally 1 over 3 and then a narrower band of 2 was added for reasons that we might never know. Above the shield there are more pointers. I am really struggling to identify what the golden stripe is. It does not conform to any of the styles of European coronet. I think that it is probably part of the baroque frame around the shield. There seems to be mantling entwined around it. Had it been a coronet the mantling would not have touched it at all. Above it is a "panache" of 3 feathers - white, red, white. Generally, but very roughly - 1 was for a knight, 3 was untitled nobility, 5 was titled nobility, 7+ was royalty and high honours. Roughly because mayors and guild leaders might use 3 feathers - the edges of who got what were very blurred. So, where do these arms come from? I think his arms (including the panache) could come from Poland or elsewhere in eastern Europe. Her arms are more difficult but have an Italian feel to them. The question that must always be asked first when dealing with arms is "time and place". That is to say, when did they come into being and where did they come into being? The where is currently problematical, but the when might be easier. I think that you should try and identify the style and era of the clothing the sitter is wearing. That will tell you that the arms were in existence before that time. It might also give a clue as to where that style was considered high fashion. Thank you very much for your very interesting response. I'm currently studying the dress and will keep you posted in the coming days. One thing I can already say is that the clothing shows she is from a very wealthy environment; also, it looks very Italian to me. In her left hand, she is holding a very rich and specific lace handkerchief, which I hope to identify soon.